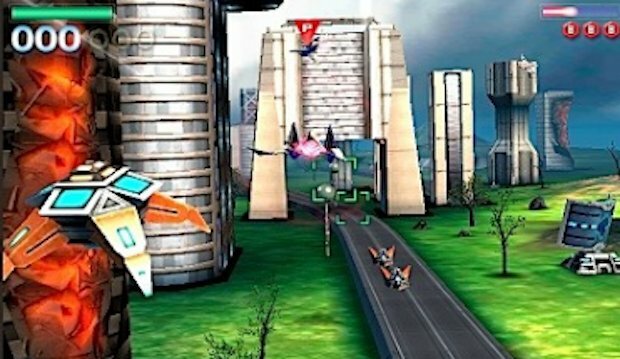 My introduction to Star Fox came from the GameCube adventure Star Fox Assault. I greatly enjoyed Assault several years ago when a friend let me borrow his GameCube and the game. 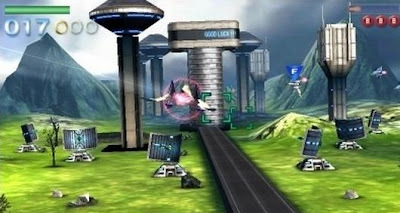 According to most game reviewers out there, Assault is considered the worst of the series and Star Fox 64 has been regarded as the best. So when Nintendo released Star Fox 64 3D a little while back I was excited to get my 3DS fired up and popped the game in. This review was mostly done several months ago, but got lost on the burner in the mix of everything happening back in September for me. So after noticing my slip up I drove right into fixing this oversight. The result is a very late, but full featured, review of this 3DS port of the original Nintendo 64 title. I was ready to try out the new things Nintendo was bringing to Star Fox with the added 3DS features like 3D, motion sensing and online multiplayer. Unfortunately the new features only hampered the playability of this port. 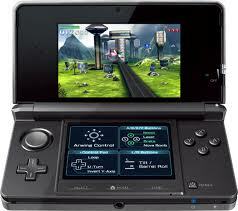 The 3DS used in the 3DS only gives the player a small window of viewing space to see the images in actual 3D. If you get out of the window the screen becomes the biggest eye sore in history. This really wouldn't be too much of a problem, except the game also features motion sensing. What do you do to use the motion sensing? You move, it's a very simple concept to grasp. Unless you are the development team behind Star Fox 64 3D. So you have a system moving to move the ship in the game and there you have a player trying to not only play the game, but also stay within this window to see the 3D of the game. After two missions I had to turn the 3D off. About three missions later I minimized the motion sensing as well. So I was basically playing a fifteen year old game on a brand new system. Getting to the online multiplayer...well every time I tried to play online it never connected to anyone or anything. So I was never able to play games online against anyone else. Add to that it's been several months since the game came out and there still is no one to play against. Now I'm not going to fault the game for that. The score I give will not be a representative of the online component. Wouldn't be fair to bash a game's online features without actually getting the chance to play them myself. For those who have been able to play online I would like to hear what you thought about it in the comments below the article. So the new stuff wasn't a great indicator of how good this game is. SF 64 3D can be beat in about two to two and a half hours, but there is different paths I could take to up the replayability of the story (since there wasn't an online scene to play with). The characters were interesting and just got the the point. There wasn't over fluffed dialog between Fox McCloud's team. This helped to get things moving into the combat quickly. All this assisting the game in being beat in such a short amount of time. If you're needing something to beat quickly before jumping into a bigger game, get this one right here. If you're wanting something that will engage you for weeks...your game is in another castle fair gamer. Can't comment on your anniversary post so I'll do it here. Happy first anniversary. I fixed the problem and you can now comment on the Anniversary page itself. Anyway, I appreciate the best wishes. I'm looking forward to the next year and I'm working on a new article detailing my new project. Thank you for your continued support of Just1MoreLevel.com and can't wait to hear what you all think about my new venture.